After you run the command if you have any shadow copy it will show the result as below, if you get the result similar to below then download a copy of dosdev.exe, just google ‘dosdev.exe download’ you will need that to mount the shadow copy as drive letter. I have underlined the time of shadow copy that I want to restore then copy the path of shadow copy. Navigate to directory where dosdeve.exe is and type dosdev v: then then paste the link you copied, see example below. v:: The operation completed successfully. There is bit more you can do with robocopy the files from your shadow copy. One of my client had Crypto Locker virus with extension .zepto and encrypted number of different directory in shared drive. 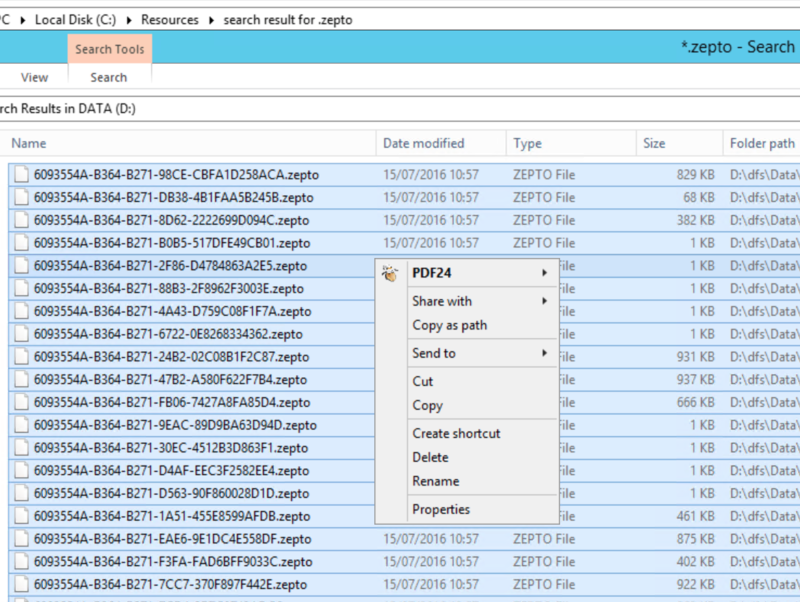 This is what I have done to recover, first logged on to the server did a search for *.zepto on the top level drive, in my case it was D:\ then I copied the search result to text file, it sound simple to copy search result to text file, if you haven’t done this before then how do you do it. You select the first line of search scroll to last line then ->hold shift and right click -> you get drop down menu select “Copy as Path” then you can open a notepad and paste. What this does is check all files and folder copy anything missing or different. I tried going to previous version in windows and browsing the copy then copy the file I needed but for this huge amount of data 10TB, didn’t wanted to do folder by folder also when it hit long file name or path then it stop copying, robocopy is the only way I found to be accurate. Then I gone back to my search and deleted all the files that ware highlighted.